Booking is essential, so please call us at the riding centre on 01248 430377, or drop us an email. We will need to know each rider’s height and weight (or age for kids under 7) when you call, so please have the details to hand. Please note that all bookings must be paid for in advance. A minimum of 24 hours notice of cancellation is required in order to obtain a refund or credit. Tucked away in the wilds of Anglesey, we can be tricky to find (but ah the peace and quiet!). You can find details of where we are here. If you still can’t work out how to get to us then you can always give us a ring on (01248) 430377. Once you’ve booked your ride it’s a good idea to check the directions (see above), and allow plenty of time to get here. There’s not much traffic, but it can quite often be very slow! It’s important to arrive at least 20 minutes before your ride so that we have plenty of time to find you a riding hat before your ride. We’ll also ask you to fill in a rider registration form before riding, you can also download it here and bring it with you to save some time. Before you ride for your first time with us, we’ll need you to fill out one of our Rider Registration forms. You can download one here, or fill one out at the office when you arrive, but please allow enough time! When you book a lesson, if you don’t already know what to bring and wear then please discuss it with our staff. In general whilst riding you’ll need a Riding Hat (which we can provide), a pair of suitable shoes or boots, a sleeved top that covers the shoulders and long trousers made of a thick material. We also advise that a body protector be used especially for children, although one is not essential. 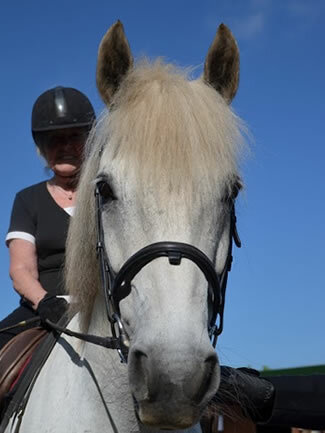 Nearly anyone can ride at Anglesey Riding Centre, and we’re especially pleased to welcome family groups and complete beginners, but you’ll need to be over 4 years of age, and not over 14st in weight.